AS IT STANDS: Did You Know That The VA Tortures Dogs? They Do, and it Needs To Stop! Did You Know That The VA Tortures Dogs? They Do, and it Needs To Stop! Veterans Administration (VA) facilities have been spending taxpayers’ money on what can only be described as torturing dogs in laboratories. about how the VA has been abusing and killing dogs in nightmarish experiments, I almost threw up! I had no idea that dogs were used in cruel experiments like this in America. *** At the McGuire VA Medical Center (VAMC) in Richmond, Virginia, experimenters are inducing heart attacks and other cardiac ailments in more than 100 puppies and forcing them to run on treadmills to stress their hearts, after which they’re killed. *** At the Zablocki VAMC in Milwaukee, experimenters are planning to drill holes into 150 beagle puppies’ skulls and cut into their brains. *** The Stokes VAMC in Cleveland spent more than $23,000 of taxpayers’ money since 2016 to purchase dogs for experiments in which their spinal cords will be intentionally damaged. *** And, until recently, for more than 20 years the Los Angeles VA was operating a secretive facility that bred dobermans to suffer from narcolepsy, injected them with methamphetamines and in some cases killed and dissected them. Thanks to a brave whistleblower, members of Congress and pressure from the White Coat Waste Project, the Los Angeles VA has announced its discontinuing these experiments and closing the breeding program. Thankfully, this is an issue that’s uniting Republicans and Democrats to take bipartisan action. If you're shocked by this display of cruelty to man's best friend I urge you to to contact VA Secretary David Shulkin to end this abuse. Sgt. Miller has started a Change.org petition that you can sign to make your voice heard. 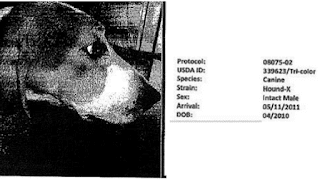 After all, taxpayers like us are the ones footing the bill for the VA’s deadly dog experiments.